The start of the new year certainly brought us a fresh crop of solar innovations — as always in our monthly “Solar Everywhere” series, we look at where solar is popping up beyond the roof. We’ve got a broad array of findings this month, so let’s start small and work our way up. First: A solar street bench. 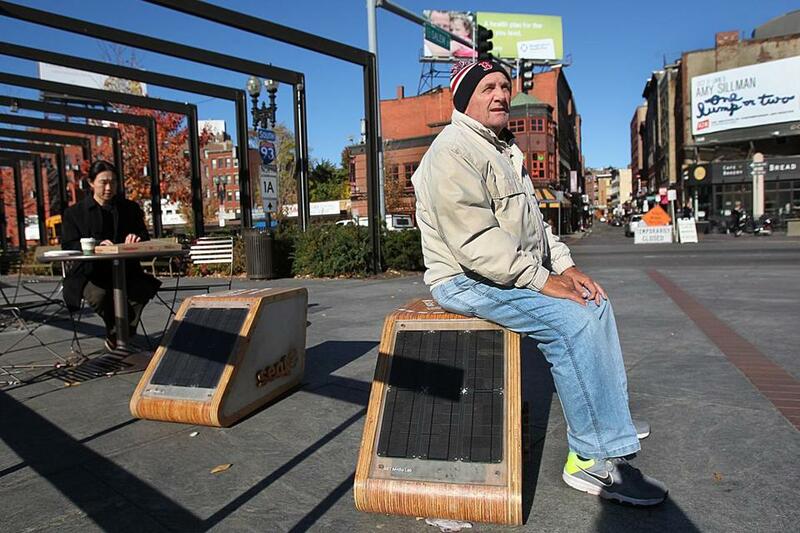 As part of the city of Boston’s overarching Complete Streets initiative, which aims to make city life more efficient, people-friendly and green, the city just two benches with solar panels included, which can be used to charge mobile phones while people sit and rest. Solar soldiers: Writing in Forbes, Navigant Research points us to trends in solarizing soldiers, allowing fighting forces to carry solar panels instead of a dozen pounds of batteries. Among the products are two that bear acronym-friendly names that would only exist in the military: the Rucksack Enhanced Portable Power System (REPPS) — pictured at right — a portable solar power source, and the Soldier Worn Integrated Power Equipment System (SWIPES), a wearable charging system. Solar roof tiles: OK, so this doesn’t fit our mandate of looking only at solar freed from the roof, but it’s pretty neat nonetheless. Via Inhabitat, a look at Swedish company SolTech, which has created the SolTech system, using glass roof tiples to heat or even power a house. Frida Jeppsson writes, “The tiles are installed on top of a black nylon canvas, under which air slots are mounted. The black colour absorbs heat from the sun and the air starts to circulate. The hot air is then used to heat up water, which is connected to the house’s heating system via an accumulator. The beauty of the system is that it cuts energy costs throughout the year, during dark winter days as well as night time, due to its capacity to store heat in the isolating layers of air under the canvas.” They look quite pretty, as well! Solar-powered trike: The ELF is a solar egg of a bike, a three-wheeled pedal machine created by Organic Transit, it combines the best parts of a car and a bike, and it’s powered by the sun (and your feet). With a hard shell and an electric pedal-assist engine, the ELF aims to make it impossible to resist biking — you could commute in style with minimal effort an sweat, or you could push your giant egg across town and glow with pride at your eco-lifestyle (and a fine sheen of sweat). Either way, at $5000 to start, the ELF isn’t for the faint of heart or weak of leg, but it’s a fine-looking machine. WaterFX’s solution comes in the unlikely shape of a vast bank of parabolic mirrors and an advanced “multi-effect” evaporating unit. The Aqua4 system offers a renewable method of desalinating briny water, which, if its developers prove right, could put California “on a path to water independence”. And that wraps up our small-to-big rundown of solar innovation for the month. With the Super Bowl coming up in just two days, we will be curious to see if solar makes an appearance — for instance, when is SolarCity going to run a SuperBowl ad? The post Solar Everywhere, Jan. 2014: Solar Soldiers, Bridges & More appeared first on Solar Power. This inspiring story is making the rounds on the internet this week: Eden Full, a 21-year-old junior at MIT, who has long been a solar innovator, gets a profile on Mashable for her creation of a low-cost way to greatly improve solar panel performance. Full’s Sunsaluter (pictured at left) is a solar-tracking device that makes it easy for people in the developing world to get as much as 40 percent more power out of their solar panels. Using an old soda bottle and the ages-old principle of water clock, Full has created a cheap solar-tracker that moves the panel to follow the sun over the course of the day, dramatically improving the amount of electricity it can generate. At first glance, Eden Full may seem like a typical Princeton undergrad, but she’s far from typical. The 21-year-old is a Thiel Fellow and inventor of The SunSaluter, a solar panel that pivots to face the sun without requiring a motor. Full didn’t set out to radicalize the way the developing world sources power — she was a self-proclaimed “solar enthusiast” by the age of 10. But her ingenuity and a tip from someone at an international science fair led her to optimize solar energy, so a solar panel produces up to 40% more electricity. And all it takes is gravity and some soda bottles. Below is a short video interview with Full, highlighting the impact her work has had, and likely will continue to have as her company expands its reach in the developing world. Sunsaluter photo CC-licensed by TEDxYouth@SanDiego. The post A Simple, Low-Cost Way to Boost Solar Panel Performance by 40% appeared first on Solar Power. Last time we spoke of Apple and solar power in the same sentence, it was in September, when we shared a link to a job posting from Apple that hinted at the need for solar engineers to work on a new Apple product. Well, it looks like Apple is continuing down that path: PV-Tech is reporting that Apple just filed for a a patent that would allow iPhones and iPads to recharge using solar power. The system would accept direct current (DC) from solar panels, and AC current using a system micro controller (SMC), to an AC-DC adapter, so devices can use both solar power and an adapter. It uses existing technologies including maximum power point tracking (MPPT) and would not use a converter circuit, allowing adapter and solar power use simultaneously to power devices or recharge batteries. Whatever device Apple is working on would allow users to recharge using either the sun or the wall, whichever is more convenient or accessible. There’s no real “range anxiety” concept associated with solar-powered phones (that we know of), otherwise we’d have to go ahead and call this the Chevy Volt of phone chargers. But realistically, this is yet another cool way to spread the word about solar. DIY solar iPhone charger photo CC-licensed by Flickr user Bryan Lee. The post Apple Takes the Next Step to a Solar iPhone with New Patent appeared first on Solar Power. The phrase “solar boom” has become a cliché at this point: Since 2010, demand for clean energy from the sun has more than doubled, rising from around 4 gigawatts per three-month period globally in 2010 to more than 8 GW each quarter in 2013, according to the latest quarterly solar tracking report from SolarBuzz. Over the past six months, during the second and third quarters of 2013 (April-June and July-September) more than 17 gigawatts of new solar capacity were added worldwide. And SolarBuzz predicts that the pace is only going to accelerate, with another 10-12 gigawatts of solar power coming online between October and December. The findings of this quarterly report from SolarBuzz are echoed by another quarterly tracking report, this one published by IHS. According to the IHS tracker, 2014 will be the year of fastest growth for solar in the last three years, growing 18 percent over the course of 2014 and reaching 41 gigawatts of total solar capacity worldwide. What’s driving this rapid growth? Strong demand from the United States and China, first and foremost, with incentives for solar installations as one main factor. We’ve seen recently that laws encouraging homeowners to go solar have strong support across the country. Although IHS and SolarBuzz disagree on just how much bigger the solar boom will get in 2014 — SolarBuzz predicts global capacity to climb to somewhere between 45 and 55 gigawatts, while IHS sets a more conservative target of 41 gigawatts — both groups agree that the future is still bright for generating clean power from the sun. The post Solar Power Boom Continues Through 2013, May Expand In 2014 appeared first on Solar Power. Last week, we wrote about a few innovative efforts to crowdsource renewable energy, particularly solar garden and community solar efforts in Colorado — as well as an ambitious community wind project in the Netherlands. Since we wrote about those efforts, a few more crowdfunded-solar news items have crossed our radar, making us think that there’s real steam behind people-powered renewable energy. New Era has much more information, and is still raising money on their website. The second story comes from New America Media, and aired on KALW public radio last week. It’s a profile of RE-volv, a nonprofit that lets individuals donate small amounts of money that are then pooled to help bring solar power to community centers. It happened for the Shawl Anderson Dance Center in Berkeley. As piano melodies spill out the door, and dancers walk in and out, Managing Director Rebecca Johnson explains how and why her studio went solar. For one thing, she says, they were spending about $400 a month on utilities. Then they noticed their neighbors. “All our neighbors are totally residential homes and when they got solar, we thought wow our roof is the same exact slope as well,” says Johnson. As they were figuring out their options and getting quotes, they got an unexpected offer. A man named Andreas Karelas offered them a lease to own system that would power 100% of the center’s electricity needs. They wouldn’t owe any money up-front and their monthly bill would drop. RE-volv’s business model is much like that of Mosaic, which brings small-scale investors on board to fund solar projects, and guarantee a 4–6 percent rate of return. Just last week, Mosaic opened up a new project to investors, a 12.3-megawatt solar system on the McGuire-Dix-Lakehurst joint Army-Navy base outside Trenton, New Jersey. With all this momentum behind giving people power over their energy, I can’t wait to see what comes next. Boulder solar photo courtesy of New Era Colorado. The post California, Boulder Get Busy Crowdsourcing Solar Panels appeared first on Solar Power. A new research report from the Solar Energy Industries Association (SEIA) and GTM Research finds continued growth in rooftop solar, even though the non-residential markets for solar panels are a bit more sluggish. The top-level number the SEIA is crowing about in its U.S. Solar Market Insight report for the second quarter of 2013 is 9,400 megawatts: That’s how much total solar capacity is installed in the U.S. as of the end of June. The report says that the pace of growth in the U.S. solar industry should is expected to push the U.S. over the 10-gigawatt level by the end of 2013 — however, the country reached that goal in mid-July, becoming just the fourth nation with 10 GW of solar capacity, after Germany, Italy and China. A solar project will be installed, on average, every four minutes in the U.S.
1. Net Energy Metering and Rate Design Battles: As we’ve discussed elsewhere, there’s is an ongoing battle on many fronts to reduce or eliminate incentives for homeowners to install solar panels. Net metering policies are the front line of this fight, and the future of these solar-friendly policies is very much in the air in Colorado and Arizona, among other states. 2. Non-Residential PV’s Tepid Growth: Although home solar installations continued to grow in the past quarter, commercial installations fell 11 percent compared to 2012. 3. The Reduction in Utility Solar Procurement: Despite record levels of adoption of utility-scale solar, in some states utilties are slowing down their purchasing from new solar projects, which introduces uncertainty into investors and solar developers. • Market ups and downs in some of the most sun-rich states: Arizona’s installations fell 8 percent over last year, likely due to uncertainty about the state utility’s support for solar. Hawaiian installations plummeted 18 percent over last year, “as a combined result of changes to building permit fees and the state PV tax credit, as well as the increasing saturation of some key geographies.” California, however, grew 4 percent in Q2 2013, particularly in the wake of the new laws supporting California solar that passed earlier this month. • Leases remain extremely popular: In Arizona, California, Colorado and Massachusetts, leases are the predominant form of solar financing. In Arizona and Colorado nearly 90 percent of installations are third-party owned, while in California and Massachusetts it’s just around two-thirds of new installations being financed through leases. Tied to the release of the report, SEIA has put together a shiny infographic spelling out the impacts of the current solar boom; you can see the image below (and click on it for a larger version). The post An Inside Look at the Solar Boom of 2013 appeared first on Solar Power. Installing Solar Panels is Cheaper than Ever — But for How Long? A drop in hardware costs has sent rooftop solar installation costs plummeting between 6 and 14 percent over the past 18 months, but high soft costs continue to prop up overall install costs. If you’re thinking of installing solar panels on your roof, there’s no better time than right now: In 2012, the cost of installing a rooftop solar system dropped by as much as 14 percent, and during the first half of 2013, system prices in California fell another 10 to 15 percent. Those are the top-level findings of the latest Tracking the Sun report [PDF] from the Department of Energy’s Lawrence Berkeley Lab. The sixth annual Tracking the Sun report, published this week, finds that it’s cheaper than ever to install solar in the United States — and that it’s likely to continue to get cheaper. Between 2008 and 2012, the average price for photovoltaic modules dropped by about $2.60 per watt, which makes up the bulk of the price reductions over that time. Other hardware costs, such as the inverters and mounting materials, have also gotten more affordable, although not as quickly or as steadily as the modules have. The report highlights two main reasons why prices aren’t even lower: The end of state- and federal-level incentives for solar installations, and the continuing high “soft costs” of solar — notably installation, permitting and inspections — are preventing even more dramatic drops in rooftop solar systems. Price drops noted in the United States were higher for small PV systems than for larger ones: Systems larger than 100 kilowatts dropped by 6 percent in 2012, systems between 10 and 100 kilowatts dropped by 13 percent, and systems smaller than 10 kilowatts dropped by 14 percent on average. Particularly telling among the findings of the report is that installation prices for nearly identical systems can be 50 percent higher in different states: For systems under 10 kilowatts in 2012, 20 percent were installed for under $4.50 per watt, 20 percent were installed for more than $6.50 per watt, and the remaining 60 percent fell somewhere in that range. Also important to note is how much more expensive on the whole solar installations are in the United States than in some of the world’s largest markets for solar power. In Germany, Italy and Australia, prices for small residential systems can be 40 percent lower than in the U.S. Much of this difference again comes to lower soft costs overseas. Falling solar prices is of course welcome news, although the issue of soft costs remains troubling. Fortunately, recent weeks have brought encouraging signs from California and New York highlighting efforts in both states to speed solar permitting and thereby lower some of those soft costs. Although the full Tracking the Sun report is highly technical and wonky, you can download the PDF from Lawrence Berkeley Lab. The post Installing Solar Panels is Cheaper than Ever — But for How Long? appeared first on Solar Power.